Published on November 2, 2017 in general info and style. Closed Tags: Cape Cod Luxury condo sales, Cape Cod new construction, Cape Cod real estate, Cape cod real estate sales, Provincetown luxury homes, Provincetown new construction, Provincetown real estate. 11 Thistlemore Road is a three bedroom four bath home with 2,608 square feet on a 8,276 square foot lot. It is a stunning renovation of one of the most dramatic houses in the neighborhood. It is being marketed for $1.349M. 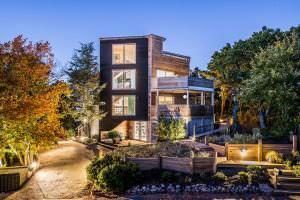 MLS Remarks: A rare find in Provincetown … a contemporary home with a modern day appeal.Perched at the peak of a private neighborhood, take in the commanding views of the bay and backside dunes from the 400sf top floor deck. Rest and relax in the sun or shade on one of the many private decks or screened in porch. Both the garden guest suite and master bedroom floor provide wonderful generous privacy. The stylish modern Leicht kitchen and amenities lead to additional elegant open space for dining and cocktail parties. Improvements include hardwood grade A oak floors throughout,specialty lighting, top notch fixtures, integrated landscape design, new roofing, renovated baths and more. Listing courtesy of William Ravies Real Estate. See all available properties at Bechfront-Realty.com.